I’ve got a pretty cool Champ for you today. This one has got a lot of interesting stuff going on. First of all, it is a 5E1 model Champ. It is serial number C-00019 making this one of the very first 5E1 models made. Dating this amp by serial number alone tells us it was made in 1955. The serial number is located in a couple of places – on the tube chart and then on the chassis. You can see from the photos that on the 5E1 model the serial number is stamped on the underside of the chassis, in between the tube sockets and next to the speaker plug. The 5F1 model moved the serial number to just below the fuse cap on top of the control panel. We know this amp was made sometime in 1955, but we need to check out the two letter tube chart code to determine a month and check our serial number date. The tube chart is stamped EH telling us this amp was made in August of 1955. Now with a low serial number you might think that something is off between these two methods of dating a vintage Champ. A low serial number doesn’t necessarily mean it was made earlier in the year. You have to consider that there were approximately 2000 of the 5D1 model Champs that were also made in 1955, logically during the first part of the year. There were only about 800 of the 5E1 models made in 1955, so everything adds up. What else do I like about this amp? 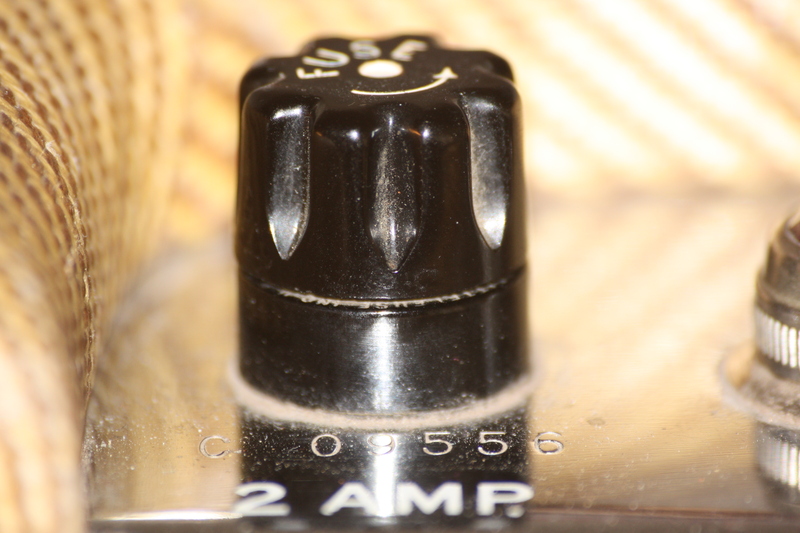 It is missing a large section of its tweed covering, right across the top right side as you face the front of the amp. What I like about this is that is really shows off the Champ cabinet construction. You can clearly see the finger joints and why it was necessary to cover them up. They just aren’t all that pretty to look at. I’ve also got a photo of the speaker and speaker code. This is less accurate method for dating a vintage Fender amp but it is interesting nevertheless. The speaker code is 395450 This tells us that it was made during the 50th week of 1954. This would make sense because any components would need to be made prior to being installed into an amp and it was typical for parts to sit in a warehouse till needed. I haven’t been able to confirm this but it seems logical to assume that the 395 portion of the speaker code stands for Cletron – the Cleveland Electronics Company. Last cool thing. In the photo of the speaker code, take a look just to the right of the brown power cord. You can just barely make out the shadow cast by a portion of the label on the 5Y3GT tube – in reverse.